At New Hope Post Acute, we provide a continuum of care that bridges the gap between hospital and home. Whether you are in need of short-term rehabilitation or long-term care, our team works to help you recover and return home. We want to empower you to meet your goals and regain your quality of life. Whether you are in need of post-acute (short-term) or long-term care, our skilled nursing communities are designed to promote rehabilitation in a high-quality and compassionate environment. As a resident, your needs and preferences shape your experience, from food choices to activities. We are committed to helping you feel at ease, at rest, and at home. Rehabilitation therapy services aim to restore residents to their highest level of functioning. Physical therapy is designed to relieve pain and enhance health. Occupational therapy strives to equip patients with the necessary skills—and often, customized tools—for proper self-care, such as dressing, personal hygiene, and cooking. Speech and Language Pathologists assist residents in achieving improved quality of life through assessment of language, swallowing, and/or cognitive disorders. For residents with mild to moderate Alzheimer’s or other dementia-related conditions, EmpRes communities provide a structured, comfortable environment within our care center. Our care teams work to deliver consistent, stable care while creating an environment of vitality, warmth, and understanding. We use a person-centered approach and memory cues to instill a sense of familiarity. Our programs and events also encourage daily connection. Our goal is to stimulate memory and provide residents with meaningful experiences. We understand that facing a loved one exhibiting symptoms of Alzheimer’s or related dementia can be a confusing and troubling time in your life. We will help you to understand the disease and gain knowledge about the best methods of care for your loved one. Many factors can necessitate temporary placement in a warm, welcoming environment that provides skilled nursing care. Our short-stay program, also known as Respite Stay, provides time you need with the peace of mind knowing your loved one is cared for in a comfortable and supporting place. To enhance quality of care and life, EmpRes strongly supports your right to make decisions about your care, including whether to accept or refuse life prolonging measures and treatments. We understand this is a challenging time for you and your family. We work together with you and your family to provide support and information for proactive self-advocacy and care decisions. We offer dignified care, symptom management, and physical, emotional, and spiritual comfort to individuals suffering from a life-threatening illness. Our team collaborates with your and your physician to maximize your quality of life by developing a plan of care based on your diagnosis, symptoms, and other individualized needs. We are committed to providing better healthcare, improved relationships, and a greater quality of life for our residents and their families. In addition to our primary services, we also offer supplementary care options to meet all aspects of your care needs. If our center cannot provide the care you need, we will happily direct you to the best options in the community. New Hope Post Acute is centrally located in a quiet area next to El Pescadero Park. We believe our friendly, secluded, residential neighborhood is a wonderful environment for our patients. With easy access to the freeway and Tracy Boulevard, family members and friends visit often. Residents can look forward to a variety of healthy and delicious meal options. We feature several options for breakfast, lunch, and dinner, as well as soup, salad, and sandwiches to provide residents with a wider selection of meal options. We seek to create healthy menus that accommodate each resident’s particular dietary needs and preferences. Delicious meals prepared fresh by our culinary teams each day. A selection of both classic and regional favorites, including accommodations for religious and cultural preferences. Fresh fruit, snacks, and beverages available throughout the day. Reduced-fat, low-calorie, high fiber, low sugar, and low sodium options. Modified diet plans, including delicious purée options designed to tickle the taste buds. Our dedicated activities team develops an extensive calendar tailored to your specific needs and preferences. We offer a blend of activities and outings that enrich the body, mind, and spirit. Activities range from weekly field trips into the community, to on-site performers, visiting school children and therapy animals, various groups and games to play, and of course, plenty of Bingo. We also organize plenty of special events throughout the year. These may include cookouts in the summer, Mother and Fathers’ Day buffet luncheons, annual holiday parties, Sunday dinners and a trip to the movie theater complete with popcorn and candy. We also encourage family and friends to participate in any of these activities. Interpretive services are available to patients for any type of care. They are provided at no cost and are available daily around the clock. Please notify the Charge Nurse, the Director of Social Services, and/or the Executive Director for assistance in obtaining interpreter services. *Press “1 to request an interpreter.” Contact the Charge Nurse, the Director of Social Services, and/or the Executive Director for the Center Code. Our dedicated staff is available 24-hours a day to meet your care needs. We treat our residents and their families as valued friends and respected members of our community. When is it time to consider a nursing home for my loved one? It may be time to consider a nursing home environment when both medical and personal care needs have become too great to handle at home or in another senior living community. This may be due to a recent hospitalization, or a chronic illness which has gradually been worsening. Who do I speak with about financials, billing, and admission paperwork? We have a full-time business office manager for all financial and billing concerns. If you have any questions regarding these matters please make an appointment with our business office manager through the front desk. What can residents bring with them? We provide all of the furniture your elderly parent needs in their room. However, to make it feel like home, most skilled nursing centers encourage residents to bring personal items such as family photos, a familiar bedspread, and treasured knickknacks. How often does a physician or health professional visit? Physicians generally see residents upon admission and once every 30 days thereafter. Though the physicians aren’t there every day, our nursing staff is in constant communication with each physician that visits the facility. Residents may take a leave of absence with a physician’s authorization, which can be arranged through the nursing staff. Residents who take a leave of absence must check in and out with the leave of absence (LOA) book at the nursing station. Can I bring outside food in? Please make sure to check with the nursing staff before bringing food in to ensure the food complies with special diets. Any food kept in resident rooms must be in a properly sealed container. There is no substitute for a meaningful career. Join us today! 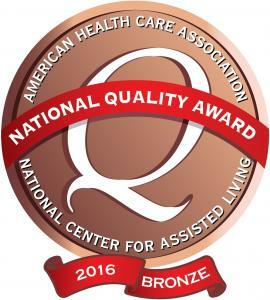 We pride ourselves in setting standards for excellence and strive to provide the highest quality care to our patients and residents. If you’re looking for more than just a job, explore our career opportunities. You’ll find work that is challenging and rewarding, maximizing your strengths and skills while making a difference in the lives of others. Seven states. More than five thousand employees. One EmpRes Family.